Voting has started in the 2017 General Election, with advance voting places now open around the country. Anyone who is ready to vote can cast an advance vote between September 11 and September 22 at one of the 480 advance voting places right around New Zealand. Voters can also enrol, check or update their enrolment details at an advance voting place. The last day for voting is election day on Saturday, September 23. This is traditionally the day most people vote. Approximately 2400 voting places will be open on election day in locations where people work and live, for example, schools, shopping malls and community halls. The Electoral Commission’s Chief Electoral Officer Alicia Wright said that there is a list of voting place locations and opening hours at www.elections.org.nz so that voters can plan where and when to vote. “My suggestion is to make going to vote a family occasion. Make sure that your friends and family can get to a voting place, and take your children with you so they see what voting is like,” she said. “We want everyone who is eligible to vote in this election so they can have their say on the decisions made in Parliament,” Ms Wright said. People can enrol to vote right up until Friday, September 22, but they cannot enrol on election day itself. “One of the easiest ways to enrol at this stage is to do it on the spot at an advance voting place,” Ms Wright said. To be eligible to enrol and vote, a person must be 18 years old or older, a New Zealand citizen or permanent resident, and have lived in New Zealand continuously for one year or more at some time in their life. Voters already on the electoral roll should receive an EasyVote pack in the mail before the election with all the information they need to vote. It will include lists of parties and candidates, locations of voting places, and an EasyVote card which makes voting quicker. When voters go into a voting place, they should give their EasyVote card to the issuing officer to help find their name on the electoral roll. They will be asked to confirm their name before being given a ballot paper. If people do not have an EasyVote card, they can still vote, and will just need to tell the person their full name and address. No identification is needed when people go to vote. Once voters have been given their ballot paper, they can go behind a private voting screen and mark their ballot paper. “There will be a list of political parties on one side of the ballot paper, and on the other side, a list of people standing for election as the local Member of Parliament. “Place a tick by the name of the political party of your choice and a tick by the name of the candidate you would most like to represent your local area. These are your party and electorate votes. “Afterwards, put your voting paper in the ballot box – it is that easy,” Ms Wright said. The votes will be counted once voting closes at 7 pm on September 23 and the preliminary election results will be released. The votes are counted again over a two-week period before the official results are declared. Under the New Zealand voting system MMP, coalitions are often needed to form a government, and negotiations will take place after the election between the parties that make it into Parliament. 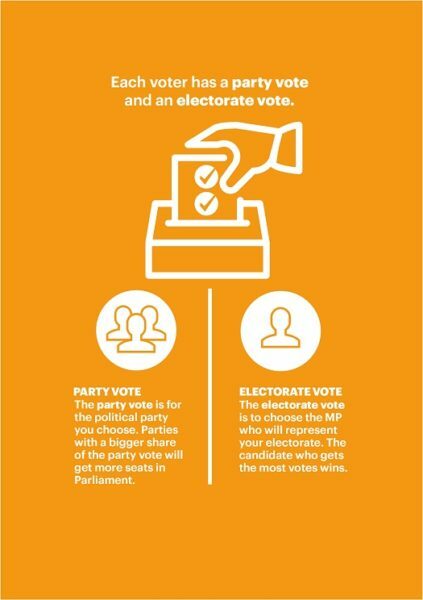 More information on voting under MMP can be found at www.elections.org.nz in many languages. “Remember, it only takes most people five minutes to cast their vote. Your vote is important, so make sure you take the time to have your say this election,” Ms Wright said. Brought to you by Electoral Commission, Wellington.